The 4* superior Mövenpick Hotel in the historical watertower from 1910, is situated in a public park in the interesting district Sternschanze. 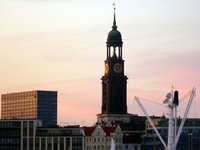 This neighborhood is popular with the inhabitants of Hamburg as well as tourists especially because of the individual restaurants, bars and shops. The hotel has 226 modern equipped rooms in the tower which are shaped like pieces of cake around. For that reason you have an amazing view of the city or the green park from every room. The lifestyle bar “Cave” is situated in the historical water reservoir and offers creative drinks in a cozy atmosphere and is an insider tip between the inhabitants of Hamburg. The hotel has a fitness room and a relaxing sauna area with two saunas and tingly wellness showers. And no matter why you are visiting Hamburg, the Mövenpick Hotel is the perfect place for a memorable stay in Europe’s biggest watertower. The combination of modern design and the basic structure of this historical landmark make this hotel unique. Paired with the distinctive excellence in Swiss hospitality, we make your stay in Hamburg a perfect experience.